It’s an indisputable fact of life that it’s no fun without tasty and gourmet meals. And a big part of creating those tasty and gourmet meals is using the right tools and cookware. So why are so many people still using bad and cheap cookware that leaves half their food burnt and the other half stuck to the pan, where it needs to be scraped off into the trash, often brining much of the pan’s cooking surface with it? We have no idea either, but we do know that there are tons of excellent, high-quality cookware sets out there that help you cook delicious and amazing meals that don’t end up in the trash – and actually last several years of good use. And while there are many good options out there for excellent cookware, one that we’re big fans of is ceramic. This is the number one reason people reach for ceramic cookware. Ceramic is ultra-smooth and naturally non-stick (when properly pre-heated, before you add the food), so you can use a little bit less butter or oil when cooking. And, it’s free of the many harmful chemicals often found in cheaper, traditional non-stick coatings: PFOA’s, PTFE’s, etc. In fact, there are generally no added or chemicals or harmful substances found in pure ceramic. This also means it’s pretty easy to clean; be sure to wipe any oil or grease out of the pan after cooking or give it a light washing. Avoid abrasive cleaning methods or soaps in order to maintain the smooth, perfect cooking surface. Some cooking metals, like cast-iron, copper and raw aluminum, can actually react with acidic foods (like lemon), even leaching into the food. While this is not harmful in small amounts, it can affect the flavor, color and quality of your food and could cause problems over time. (Some people actually like that cast-iron leaches into their food, but that’s a topic for another time). Ceramic, on the other hand, is non-reactive, so you can cook virtually any food you like in it, without fear of leaching or affecting the flavor of quality of the final product. Ceramic cookware usually uses a stainless steel or aluminum base, both of which do an excellent job at conducting heat and transferring it evenly across the cooking surface (when made with a thick, even cast). The ceramic coating itself conducts and transfers that heat into the food just as smoothly and evenly. The ceramic non-stick coating is the most expensive part of ceramic cookware, and it’s worth spending a bit more money to get the highest-quality product you can. When you do spend those extra bucks, you’ll end up with a much more durable set that will last years. But since ceramic is usually based on stainless steel or aluminum, it’s affordable to start out with. Again, since ceramic is based on aluminum or stainless steel, it’s a very lightweight option for cookware. It’s only about as heavy as a respectively built aluminum pan, and is far, far lighter than cast-iron cookware. If you’re familiar to cooking with cast-iron, a quality ceramic pan will feel like a breeze to use. So what are the cons to using ceramic cookware? Maybe it’s just us, but we’re partial to metal utensils; they’re easy and safe to use in a way that flimsy plastic isn’t, and often much easier (and thinner) than wood. 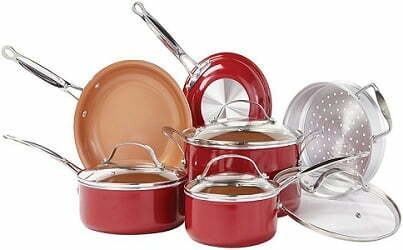 On lesser ceramic pans, however, metal can scratch the non-stick coating. Many brands advertise their ceramic cookware as dishwasher safe, and many newer models might actually be okay in the dishwasher. But most ceramic pots and pans (especially less-expensive ones) simply aren’t durable enough for use in the dishwasher. Unless you’re positive that you’re using some extremely high-quality, dishwasher-safe ceramic, we recommend hand-washing it. Ready to find the best ceramic cookware for your kitchen? Here are our top picks for the Best Ceramic Cookware of 2018. 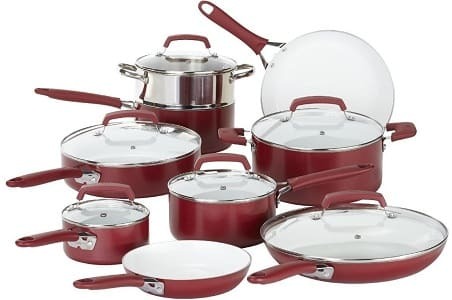 The Cuisinart Ceramica Cookware Set is some of the the finest ceramic cookware for an affordable price, consisting of a collection of pots of various sizes, a sauté pan and two skillets, and even a colander, for much less than other high-end sets. Each piece (minus the colander) is made from an aluminum core, coated with a protective metallic finish on the bottom and a ceramic non-stick finish on the cooking surface. The non-stick ceramic surface is titanium-reinforced for finish and durability, and is free of PFOA’s, PTFE’s and PFO’s, while the metallic layer and aluminum core allow for even heating on all cooking surfaces (such as induction cookers). Each piece of cookware features a silicone handle for grabbing and is oven safe to 350F. The edges and lips of the pots and pans are also tapered for easy pouring. In action, these pans work superbly well; food doesn’t stick to them, they’re light and wieldy, and super easy to clean. Their largest drawback, however, is that the ceramic finish will stain if you use non-stick spray on them. They are also not dishwasher safe. Otherwise, they’re an excellent set of ceramic cookware for an incredibly-good price. Metallic outer layer adds durable and works on all cooking surfaces – even induction. If you’re looking for the ultimate in budget combined with non-stick cooking, the T-Fal Initiatives 14-piece set delivers. 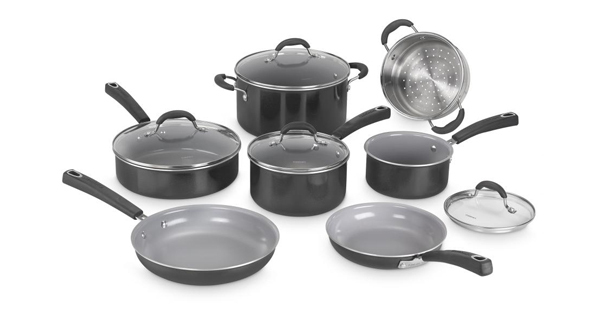 It’s got 14 pieces of heavy-gauge aluminum cookware coated with a PTFE-Free, PFOA-Free and Cadmium-Free ceramic finish that is safe up to 570F and oven-safe up to 350F. The metal conducts heat well, the non-stick coating actually works, and the setup makes for easy cooking and cleaning. There are, admittedly, a few drawbacks however; the non-stick surface will stain when using cooking spray; you can’t use metal utensils; T-Fal does not recommend them for cooking on high heat and there have been stories of them warping; and the lids are not very high-quality, sometimes exploding or cracking in the heat. Still, they’re super cheap -and you get an entire 14-piece cooking set. And the non-stick ceramic surface really does work well. If you’re on a budget, you could do worse. You’ll pay more for the Wearever Ceramic Cookware Set, but it contains 15 pieces for cooking virtually anything. It’s one of the most-durable cookware sets on our list, made from a heavy-gauge aluminum with a ceramic coating free of all those harmful chemicals. The non-stick coating can also be heated up to 750F without damage, and the entire pot/pan setup is oven-safe up to 350F. In the kitchen, these pots and pans work extremely well, distributing heat evenly and making nice sears and consistent cooking. They’re pretty easy to clean, as food doesn’t stick, and you can just stick them into the dishwasher to make quick work of them. And with 15 pieces of cookware, there’s something here to cook virtually anything: crispy fried chicken or fish, perfect steaks, incredibly-over-easy eggs. With that said, they are not indestructible. The non-stick coating will stain after a while, especially if you use lots of cooking spray, and the finish will start to crack and peel, especially on the bottom. Some people also report that they don’t do well in the dishwasher. For the versatility, consistent cooking and sheer number of pieces the WearEver set offers, however, it’s still an excellent choice. Oven safe up to 350f. It covers almost everything you need for cooking in this collection of natural non-stick cookware set. It has classics like stockpot, saucepans, and skillets, to manage almost any dish in your recipe book. This cookware is made of exclusive nano-ceramic technology provides non-stick cooking surface that is smooth enough to release food. It has natural and smooth interior which doesn’t absorb food tastes and stain. It is both PTFE and PFOA free. It is recommended to wash it with hands using a mild detergent to maintain its shine. Use soft sponge or dishcloth to wipe it so they can last for years. Greenlife cookware is a bit more expensive, but if you’re concerned about your health and chemicals in your food, they are the perfect option. They put extra care into creating their Thermolon Ceramic coating, using a special process to manufacture it entirely free of all toxins, including Lead, Cadmium, PFOA’s, PTHE’s and PFA’s, etc. As a result, you can cook with them worry-free, knowing your food is clean and toxin-free; the coating lets food slide right out, and avoids major cleaning. The cookware itself is evenly cast for consistent heat and good conduction, and they’re oven-safe up to 350F. The handles feature silicone to keep them cool, while the ergonomic shape is easy to wield. Finally, they’re also dishwasher safe. The Greenlife Ceramic Cookware set is one the more-expensive side of things but has the quality and non-stick ceramic coating to make that price tag worth it. You can also get them in an assortment of fancy colors. If you need plenty of cookware without an expensive price tag, Red Copper offers this 10-piece set of aluminum pans with a copper-infused ceramic coating. The aluminum makes for a strong pan with excellent heat conduction, while the copper-infused ceramic finish keeps food from sticking and makes cleanup easy. 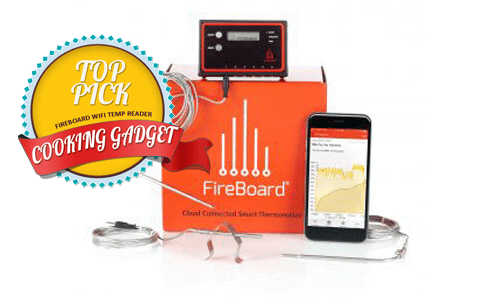 It’s free of PFOA’s and PTFE’s, and oven-safe up to 500 degrees. So while the construction seems nice, the non-stick finish really isn’t. It peels off after some time, and does not work with metal cookware; it will scratch right off. Likewise, the bottom of the pots and pans start to scratch and peel after some time, too, often leaving residue all over your stovetop. If you’d like a 10-piece setup for not a lot of money, this is a decent set. But there are also better options out there. Now for something a bit more unique. This 8-piece cookware set from Vremi consists of two Dutch Oven pots, 1 casserole pot, and 2 angled frying pans, each with their respective lids, all made of a durable die-cast aluminum body and designed to go straight from the stove or oven to the table. They have marble-coated ceramic surfaces for non-stick and added durability and are non-toxic and BPA-free. The coating is heat-resistant up to 500F and can be stuck right in the oven without a problem, and according to many, works incredibly well; eggs slide around the pan no problem, steaks sear without sticking, and cleanup is super easy. Beats many “non-stick” surfaces that just crack, peel and fail. Another thing the Vremi set has going for them are the insanely good looks. 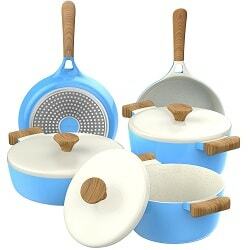 The handles are made of Bakelite (a precursor to plastic, made for high-heat) and given faux wood accents, and the cookware comes in your choice of bright Blue and White, Green and White or Yellow and White colors. Furthermore, the pans are designed to be used on all cooking surfaces, including induction stoves. The pan also features a curved shape, with gently-sloping edges, to allow for easier flipping. Our biggest complaint is with the handles. The material used is not very good with high heat and gets hot, making it difficult to grab and move the pots and pans. It will also crack if subjected to high heat over time. Otherwise, this is a beautiful, quality cookware set that looks great and cooks even better. 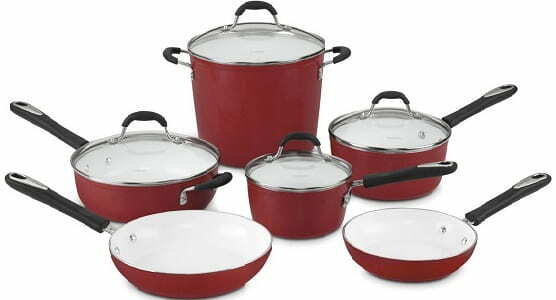 They also sell a 15 peice set which dose not include the two dutch ovens, but it’s about half the price of this 8-piece set. 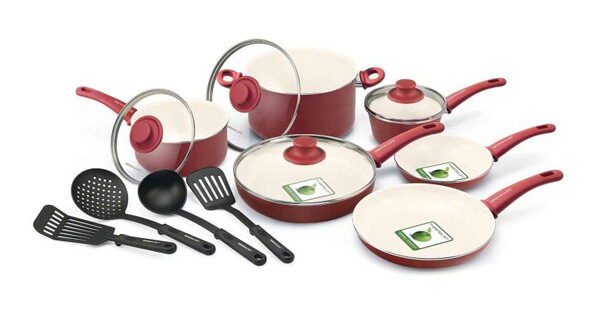 Like Greenlife, Greenpan makes safe and healthy cooking tools and utensils, like this 12-piece ceramic cook set. It uses a sand-derived Thermalon Ceramic coating, containing no PFOA’s, PTHE’s lead or cadmium. The ceramic coating can handle temperatures up to 600F, and each piece is ready for the oven too, with stainless steel handles. The glass lids are safe up to 420F. The bodies themselves are made from anodized aluminum, hardened for sturdiness (Greenpan calls it twice as hard as stainless steel) and with excellent conductivity for consistent cooking. How do they hold up? Several users have reported spots and staining over time, especially various forms of blackening around the outside and the edges. And for some, the non-stick coating starts to peel after regular use and wears off. The lids are also apparently not strong enough for use in the oven. Considering that and the expensive price tag, we’d likely recommend passing on these pans in favor of options that are more durable, for less. Safe for temperatures up to 600F. This cookware set from Finnhomy is an excellent option for a high-quality cookware set, this time made with a porcelain non-stick coating as opposed to regular ceramic; porcelain is stronger, harder and more-refined, making the coating even more durable than your typical ceramic pan. The finish is FDA-approved and free of PFOA’s, Lead and Cadmium, as well as coated in multiple layers for abrasion-resistance; an additional clear coating makes cleaning easy. All the pots and pans are based on an aluminum core, which results in a thick, sturdy pan safe for high heat and all cooking methods – except for induction. They’re oven safe up to 350F, retain heat well and are great for cooking all kinds of food. They also come in some cool, unique bright colors, and have soft, cool silicone handles. Complaints? For one, we wish they were dishwasher safe, which makes life much easier. If that were the case, this would be an excellent cookware set at a great price. Super-hard porcelain enamel finish. Abrasion-resistant and built to last. Excellent for high heat cooking. Additional clear coat makes them super easy to clean. Gotham Steel has been doing the titanium-reinforced ceramic thing for a long time; they call their non-stick technology “Ti-Cerama,” and say that it is “ultra-non-stick,” requiring zero cooking oil or seasoning. 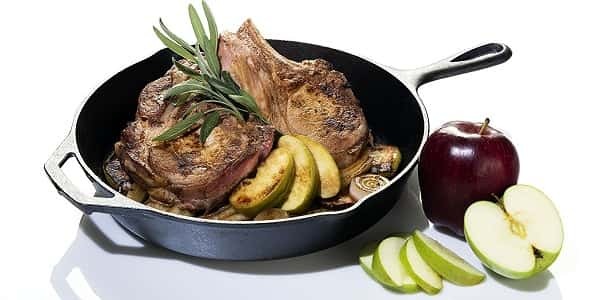 We don’t find it performs any better when cooking than other non-sticks, but is free of PFOA’s, etc, and durable; you can cook with it to temperatures up to 500F and it’s oven-safe; the inner core of the pans are made of stainless steel. 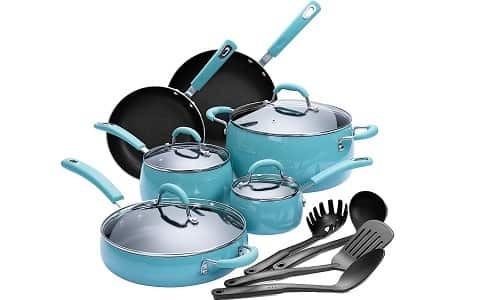 The set includes 10 pieces – two saucepans, 5qt pot with steamer tray, 8.5” and 10.5” frying pans and four tempered glass lids. Gotham Steel products are nice, but not the most durable. As with most non-stick surfaces, it will eventually start to peel and crack, and you’ll find yourself having to buy a new set pretty soon. If you stick them in the dishwasher, they will peel faster, and may even begin to warp, despite billing themselves as dishwasher-safe. They’re decently priced, however, and not a terrible choice for a lot of pieces without breaking the bank. 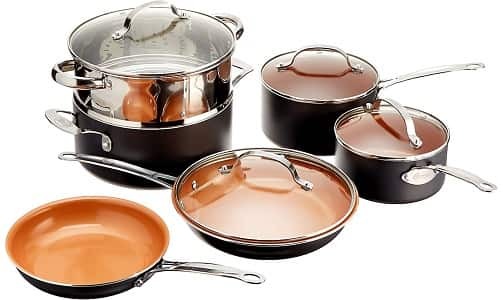 Whether you are buying the complete set or one piece, some of the common materials you may choose for cookware are copper, stainless steel, aluminum, hard-anodized aluminum, and cast iron. Despite being the heaviest and strongest metal of all, cast iron calls for proper seasoning. Another most durable and hardest cookware you can buy is hard-anodized aluminum. The best part is that it is easy to clean and a lot cheaper than cast iron. You don’t have to season it. 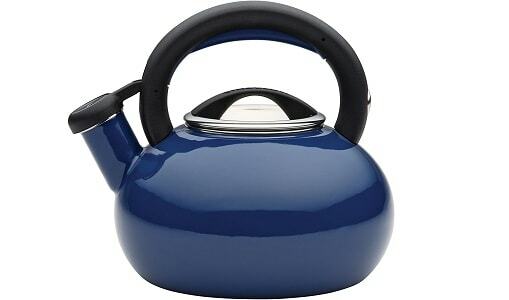 It is very durable cookware and anodization restrains the aluminum’s reactivity. Copper is very costly and stainless steel lies between copper and hard-anodized aluminum. Some of the non-metallic cookware options are enamel, porcelain and ceramic. Heavy cookware ensures even heat distribution but they are hard to clean. But lighter cookware is not oven safe and food is burned quickly. Light pots are not suitable to cook some food properly. So, it is better to pick nonstick cookware that can resist up to 500 Deg. F. Consider cleaning, storage, performance and durability of cookware. Buy oven safe cookware sets and make sure their handles are not made of wood or plastic. Also read user manual about the maximum temperature it can resist. Don’t exceed maximum temperature. Many people bought almost any cookware set without worrying about its look in the past. These days, cookware sets come in different designs and colors. Induction cooktops are supposed to be the future of modern cooking. So, you should choose cookware which is induction compatible. Induction cooktops use electromagnetic pulses to heat pots and pans. These waves affect the metal at the bottom. Make sure the cookware has iron at the bottom to work on it. Nonstick cookware must be easy to release food and cleaning it is a breeze. Be sure to pick nonstick cookware which is dishwasher safe. Also follow the user manual for cleaning instructions. To be stable, handles may have riveting attachments. But it makes cleaning a bit challenging. Don’t choose handles which are completely metallic. So, it is better to opt for silicone or rubber handles on cookware as they are oven safe. Glass lids are common in ceramic cookware sets. Make sure it is oven safe and shatter-proof. One can easily see through glass lids and monitor foods. Make sure the lids fit well, can cover pots and pans and are easy to remove. Generally cookware comes with limited lifetime warranty. But to ensure validity of warranty in wear and tear, be sure to use it as per the manufacturer’s guidelines. 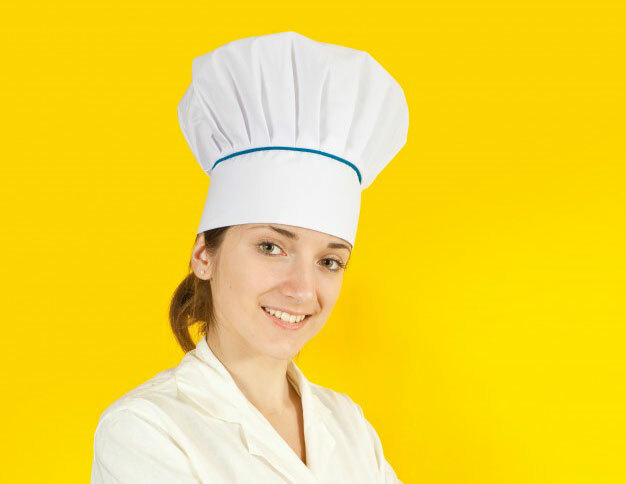 Baking Soda – If you want to remove all the oily stains and burnt food stains from your cookware, use Baking Soda. Put water to your cookware and place it on the gas and add baking soda. Keep stirring, till you see it foaming up, remove it from the stove and let it cool. Throw the cool water and wash it with the usual dishwashing bar. Concentrated Vinegar, Baking soda and water – This is another remedy to bring the shine back to your ceramic cookware. Prepare the concoction with water, 1/4th cup of concentrated white vinegar and 2 teaspoons of baking soda and bring to boil. Let it cool, then throw the mixture and wash the pot using the usual dishwashing bar. Rinse with clean water and dry. Hydrogen Peroxide – It is another agent which can help in cleaning the ceramic pots. Put an ounce on the pot and you will see it gets bubbling, just then add water and put aside. Use a soft brush to scrap off the residue. Do not use any kind of scrubbing material on the ceramic cookware as it can harm the non-stick layer of the cookware. Do not wash these in the dishwasher. Read the user manual before using the cookware. Store the cookware properly and ensure that it doesn’t get the scratches while you are storing it. Whenever you are about to start cooking in a ceramic cookware, make sure you wash it once. 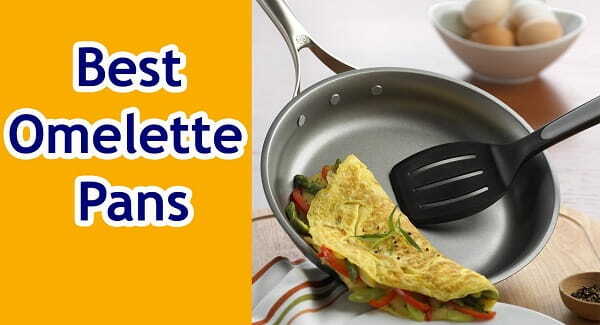 Use the utensils which are safe for ceramic cookware. Ensure that you do not drop it on the floor and also don’t plunge the cookware directly into cold water. For quality and best cooking experience, you need to choose the best ceramic cookware. We have handpicked some of the best ceramic cookware sets to give you the best culinary pleasure. 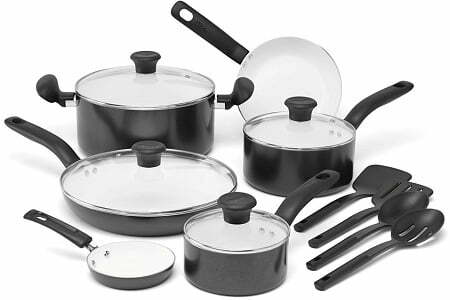 We hope, you’ve liked our tips and reviews on best cookware sets to help you in your buying decision.